This blog post is one part in a series. Click to see the other posts related to the benefits of a content management solution. Your website has been fully integrated with many interactive modules helping to drive and retain website traffic on each subsequent visit. But, what success is a website if it isn’t leading to sales and contacts? A driving factor behind many websites is conversion, be it an online sale, a web inquiry, an email newsletter sign up, or an online quote. At times, an online form doesn’t suit the needs of other online forms. That’s where a custom form builder through a content management system comes to the rescue. There could be numerous reasons to want a website visitor to contact you through a website. But, you may not want the website form to be the same for each instance. With a dynamic form builder within a content management solution, the website administrator has the freedom to create unique form pages at any time that include unique form fields arranged in a unique manner. Add as many fields and field types to custom forms. Additionally, with SilverStripe’s form builder module, it allows the administrator to use the drag-and-drop reordering to rearrange the layout of the fields in whichever order is desired. Further, the SilverStripe form builder module comes with options on what happens after a website visitor fills out a form. Website administrators can present custom “Thank You” page messages upon submission. They can even set up email autoresponders to be sent to an admin, or multiple admins, on submission so that they receive notice at the immediate moment a form is submitted. 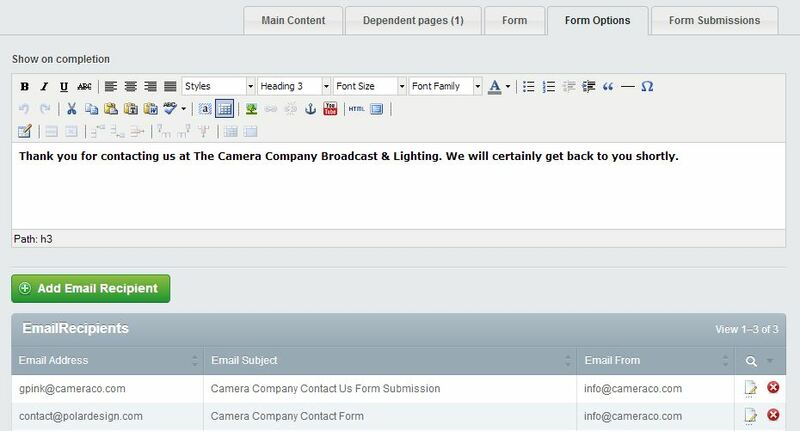 The autoresponders can also be set up for the users who fill out the form so that on submission a user will receive a receipt of their form submission. Add and maintain custom autoresponder options for individual web forms. While having a dynamic form builder on the website can make maintenance of web forms easy, the simple fact of having a web form on your website is crucial. Without it, a website will not be able to track website conversions through Google Analytics tools. With Google Analytics tools in place, website administrators can know from which sources specifically a lead or web form submissions has come, be it from a Google keyword search, an article on a third party website, or from a social media website. And, without web forms a website ultimately will never know its true ROI.